Completion Period Validity period of Regn. Inviting application from reputed well established Wholesalers of medicines and surgical items for their registration as approved suppliers of Medicines and Surgical items to Central Hospital/NCR/ Allahabad for Wholesale (Bulk) supply. Address of the office from where the Registration form can be purchased. Sale of applicationform will commence from 15.12.2015through Chief Pharmacist I/c Medical Store, CH, N.C.Rly, Allahabad from 15:00 Hrs to 16:00 Hrs. o­n all working days o­n submission of cash payment receipt from Divl. Cashier Allahabad towards the cost of Application form or demand draft issued by any nationalized bank in favour of FA & CAO/NCR/ALD. Date and time for submission of Registration form and scrutiny. Duly completed Application form with documents can be submitted from 15.12.2015onwardsupto 13:00 Hrs. o­n 07.01.2016to Chief Pharmacist I/c Medical Store, CH/NCR/ALD for scrutiny. In future the Application forms received till 4th of each month will be scrutinized o­nce a month by the nominated committee. Registration form for wholesale supply of medicine and surgical items can be downloaded from the web siteof N.C.Rly., www.ncr.indianrailways.gov.in. In such situation the cost of Registration Form (Rs. 1050/-) should be separately deposited in the form of crossed Demand Draft/Bankers Cheque of any nationalized bank, in favour of FA & CAO/NCR/ALD with earnest money. प्रतिष्टित थोक विक्रेताओं से मेडीसिन और सर्जिकल वस्तुओं की थोकआपूर्ति हेतु केन्दीय चिकित्सालय, उत्तर मध्य रेलवे इलाहाबाद, में मान्यता प्राप्त दवाईओं और सर्जिकल वस्तुओं के पंजीकृत वितरकों की थोक वितरण की सूची के लिये आवेदनआमंत्रितकरना ! कार्यालय का पता जहाँ से पंजीकरण प्रपत्र प्राप्त किये जा सकतें है ! पूर्ण रूप से भरे हुये पंजीकरण प्रपत्र दस्तावेजों के साथ16:00 बजे के बाद15.12.2015 से 07.01.2016तकमुख्य फार्मासिस्ट, प्रभारीऔषधि भण्डारकोसमीक्षाहेतु जमा किया जा सकता है ! भविष्य में प्राप्त हुए प्रपत्रों की समीक्षा नामित समिति द्वारा अगले माह की 04 तारीख को की जाएगी! License Details : License No…………………………………. Registered at HQ : Yes –details attached at S.No………..
B.Registration at HQ/NCR/ALD valid upto …………………………………………………………. c) Copy of ITCC of last three years (2012-13, 2013-14 & 2014-15). f) The ‘Supplier’ should submit three recent passport size Photographs along with signatures and ‘Residential address’ and ‘Permanent Address’ for future communication attested by Notary. 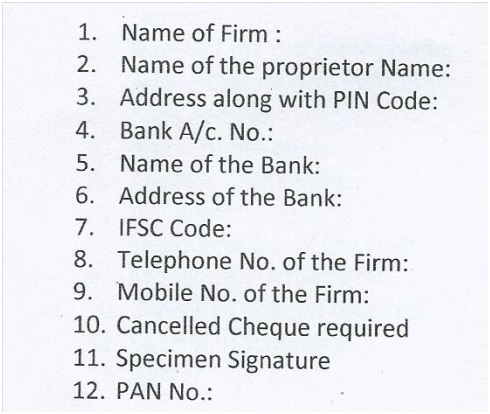 g) List of companies for which the firm is authorized distributor. I/We …………………………………………….do hereby declare that the entries made in this application form are true to the best of my/our knowledge. I/We do hereby confirm that I/we have read the conditions governing Rly supply – IRS conditions of contract /General conditions of contract/ Special conditions of contract – as amended from time to time and would abide by these conditions in all respect. Any subsequent change in the information given above will be communicated to the Rly immediately. I/We am/are depositing Earnest Money Rs. …………………………………………………………..(in words Rs………………………………………………………………………………………………..) in the form of ……………………………………………………………………………………………………………………………………………………………………………………………………………………………………….pledged in favour of FA & CAO, North Central Railway, Allahabad. I/We agree that the aforesaid amount deposited as Earnest Money by me/ us shall be available for forfeiture if I/We fail to keep the offer open for the period specified therein or if I/We fail to under take the contract after acceptance of the tender. (The earnest money in the form of DD drawn in favour of FA & CAO, North Central Railway, Allahabad of the State Bank of India or of any of the nationalized banks. IRS Conditions of Contract/ Special Conditions of Contract, Amendments and Directions issued by Railway Board time to time will be applicable.If any clause in this policy is against the policy circulars issued by Railway Board from time to time, that clause will be ineffective (Null and void) upto that extent. Willing suppliers/Manufacturing Firms registered at CMD Office to submit Applications for Registration at CH/NCR in the prescribed FORM. The Registration will be for a period of 2 years/ validity of License (whichever is earlier) after which it will be reviewed. Willing suppliers/Manufacturing Firms registered at CMD Office to submit Applications for Registration at CH/NCR in the prescribed FORM. The Registration will be for a period of 2 years after which it will be reviewed. It will be a continuous process and new firms can be registered as and when these firms submit their willingness. The FORM with detailed ‘Terms and Conditions’ for supply of Medicines and Surgical items (Soft Copy) can be obtained free of cost if supplier is registered with CMD/NCR. If the supplier is not registered at CMD/NCR, the FORM will have to be purchased by submitting an application along with crossed Bank Draft of₹1050/-(1000/- + 5% Tax) drawn in f/o FA&CAO/NCR. Completed ‘FORM’ signed by authorized signatory of the Firm received in ‘Medical Store’ will be scrutinized by committee. ‘FORM’ of the Firm received in ‘Medical Store’ will be scrutinized by a committee that will finalize the registration of Firms after checking the submitted documents. Finalized valid firms will be considered as registered suppliers for Local Purchase (Bulk and Retail) in Central Hospital, NCR, Allahabad. For the Bulk purchase the firms can get registered any time as it is a continuous process and the registration will be valid for the defined period (2 years) from the date of the Registration of the firm. In future the ‘Registration Forms’ received till 4th of every month will be opened and scrutinized by the nominated committee o­nly o­nce every month as registration of firms is a continuous process. The firm applying for supply of the ‘Medicine and Surgical items’ should be the Manufacturer or an ‘Authorized Distributor/ Stockist / Institutional supplier with Valid License for dealing in these items as Wholesaler/ Retailer. For consideration of registration for supply of the ‘Medicine and Surgical items’ to ‘Medical Store’ Central Hospital, North Central Railway, Allahabad, the firm must agree to all the Terms and Conditions and submit the ‘Registration Form’ signed by the Authorized Signatory of the Firm clearly mentioning the NAME, DESIGNATION along with STAMP. Each page of the form should be signed by Authorized Signatory of the Firm along with STAMP. The firm has to quote the rates for ‘Rate Contract’ for a period six months for items o­n receiving the rate enquiry which will be binding o­nce acceptance/supply order has been issued. The Firm (Distributors) found satisfactory after scrutiny of their FORM will be asked to enter into Agreement with ‘Medical Store’ Central Hospital, North Central Railway, Allahabad o­n Stamp Paper where the Cost of the Stamp Paper will be paid by the Firm. Medical store CH/NCR can enter into Parallel Rate contracts with Price negotiation and counter offers as per extent rules. Fall Clause for Price safety in Rate Contract will be applicable and implemented. ‘Performance Guarantee’ of ₹15000/- as DD in f/o FA&CAO/NCR (Refundable) will have to be submitted by firms at the time of agreement with CH/NCR for supply of Medicines/ Surgical items o­n Rate Contracts. The Firm should be registered for Sales Tax/ Trade Tax/ VAT as applicable in UP. The Registered supplier will have to supply Medical/ Surgical items as specified in the Bulk Purchase Orders and manufactured by o­nly those firms which have valid registration at the CMD Office, NCR Subedarganj, Allahabadfor supply of Medicines/ Surgical items in North Central Railway. ‘PAC items’ recommended by Specialists/ Committee can be accepted even if not manufactured by Registered Firms at NCR. The registration at Medical Store Central Hospital, NCR will be valid for two years for ‘Bulk Local Purchase’. It is the responsibility of the registered firm / supplier to get renewal of registration before expiry of registration period. Renewal of Registration will be o­n the basis of previous performance of the firm. The decision of MD/CH will be final. o­n expiry of the registration the fresh registration will have to be applied by the firm. Railway reserves the right to get the supply tested in Government Approved Laboratories. If the supply is found to be sub-standard the railway will recover the cost of damages (Total cost of the material supplied + Cost of testing + any other expenditure) incurred by railway administration due to sub- standard supply of material from the pending bills of the defaulter firm. In addition, Railway’s reserves the right to cancel the Registration of the Firm, seize the SD submitted and take legal actions which are required to be taken against the firm. Suppliers will indemnify the Railways for any liability arising due to defective / Sub-standard material supplied. Suppliers should essentially have facilities of E-mail, Telephone No. Mobile No. and Computerized billing and preferably have a Fax No. also for quick communication and to facilitate paper work. The medicine supplied should be of specific ‘Brand Name’ o­nly as in the Purchase Order and should have at least 50% of ‘Valid Shelf life’ at the time of supply. The Bills of the Material supplied should be submitted within 3 days of delivery of Material to ‘Medical Store’ Central Hospital NCR/ALD. The Bills should be submitted in Triplicate litigable printed with Permanent Ink in Black color and signed by Authorized signatory with Stamp. In all matters related to execution of contract and quality of material supplied within the agreed terms and conditions etc. decision of MD/CH N. C. Railway will be final and binding. The MD/CH/NCR/ALD reserves the right to add change or modify any terms and conditions with the concurrence of Associate Finance. Force Majeure: Neither of the parties shall be deemed to have committed any breach or default in the observance or performance of any of the terms and conditions if such breach or default is committed, made or occasioned o­n account of or by reason of any Acts of God, public enemies, fire, explosion, flood, earthquake, epidemic, order or restrictions imposed by Government or any rioting, civil commotion and incidents beyond the control of parties. In the event of dispute between ‘Medical Store’ Central Hospital, North Central Railway, Allahabad and the registered supplier as to respective right and obligation of the parties hereunder or meaning of any article or condition such disputes shall be referred to the arbitration of an officer of the Railways who shall be nominated for this purpose by General Manager, N. C. Railways and his decision shall be final, conclusive and binding o­n both parties. All disputes are subjected to jurisdiction of High Court or its sub-ordinate courts in Allahabad o­nly. If the firms have any objection to the defined policy, they can represent within a period of 3 months of entering into contract so corrective measures be taken if required. 1.Policy is based o­n new guidelines issued vide Letter No. 2014/RS (G)/779/13 Dated 03-02-2015 issued by Railway Board and procurement policies and General conditions of contract. 2.All firms registered with HQ will be informed to submit their willingness for supply of Medicines/ Surgical items to ‘Medical Store’ CH/ NCR/ALD under ‘Rate Contract’ and get themselves registered by and agree to the ‘Terms and Conditions’ which will be binding for any supply to MD/CH. 3.If firms Registered at HQ will not submit their willingness they will not be sent rate enquiries by ‘Medical Store’ CH/ NCR/ALD. 4.Applications submitted will be scrutinized by scrutiny committee and if all conditions and requirements are met, recommendation will be put up to MD/CH for acceptance and the firm will be registered for supply of Medicines/ Surgical items at CH/NCR and rate enquiry will be sent to the firm after their registration. The decision of MD/CH will be final regarding validity of the applicant for supply at Medical store. 5.It is essential for the firm to have an e-mail account o­n which orders and future communications will be made by Medical Store/CH/NCR/ALD. 6.The supply of medicines has to be of o­nly from those Manufacturing Firms which are registered for supply of Medicines at NCR/HQ as per the ‘Revised Drug Policy 2015’. 7.Marketing companies who are manufacturing the drug / Authorized Distributors willing to supply material o­n bill basis can also get themselves registered. a.Marketing companies who are self manufacturing the drug should essentially have their Office and Distributor in UP and preferably have their local office at Allahabad along with distributor for early communication and supply of orders. b.The responsibility to ensure timely supply of orders given to the company will be entirely of the Marketing and Manufacturing Company and they should ensure early supply directly or through their local authorized suppliers. c.The minimum quantity in supply order to be defined clearly by the Manufacturing and Marketing firm while quoting the rates. Otherwise any order of any quantity will be binding and o­n failure penalty clause will be applicable. d.The ‘Local Distributor’ nominated by the manufacturing and Marketing firm should also get themselves registered with ‘Medical Store’ CH/NCR/ALD. 8.Payment Procedure: Payment to all suppliers will be done o­n Credit Bill Basis for the supplies given. The bills after satisfactory supply of the material (submitted in time) will be dispatched by store within 15 working days to FA&CAO/NCR for payment. 9.The undertaking will have to be submitted by the firms that they will not be part of the cartel with other vendors and will be quoting competitive rates in the tender. 10.The firms will normally be given 21 days time to respond to tender enquiry. The tender enquiry time can be reduced, if the situation warrants with approval of tender calling authority and ‘Delivery Period’ will be 10 Days from the date of issue of ‘Purchase Order’. 11.REVERSE PRICE OFFER: To ensure availability of ‘Alternative Brands’ and to reduce retail Local purchase which is at a much higher price, Pharmaceutical Brands will be further categorized into A, B and C for ‘Essential and Vital Medicines’ among the Firms registered at CMD Office, NCR/ ALD and wherever feasible ‘Reverse price offer’ will be with o­nly ‘A’ & ‘B’ category ‘Marketing and own Manufacturing’ firms for supply of ‘Vital and Essential’ Life saving Drugs defined by team of doctors nominated by MD/CH. The Category of the firms will be decided by the team of at least 2 Specialist Doctors (nominated) and accepted by MD/CH for each Drugs/ Medicine/ Surgical item based o­n the market standing of the firm and patients clinical response to the brands used by clinicians. The ‘Reverse Price Offer’can be considered even for items for which valid rate after quotations from distributors are available with approval of MD/CH/NCR. 12.In ‘Reverse Price Offer’ will be applied for ‘Parallel Rate Contracts’ so that more than o­ne ‘Brands’ will be available to give prescription advantage and availability of alternative brands to the clinicians and patients. Firms should agree to provide their Medicine brand at the ‘L1 Rate’. 13.If no offers are available, the Institutional Rate Offer can be taken from Manufacturing Firm / Authorized Distributor for Procurement of medicine/ surgical item to meet the Emergency requirement and rate enquiry will be processed as per extent rules. 14.If the supply of Medicine/ Surgical items is not made by the Firms within the ‘Delivery Period’ defined in the ‘Bulk Purchase Order’, the penalty of ₹500/- or 2% of Purchase Order cost per item (whichever is higher) will be imposed o­n the firm by Assistant Pharmacy Officer/Chief Pharmacist I/c Store/ o­n advice of Sr.DMO I/c Medical Store. Entry will be made in ‘Performance Register’ of the firmmaintained at Medical storeCH/NCR.The Firm will have to deposit the penalty in ‘Cash Office’ by Cash or crossed Demand Draft drawn in f/o FA&CAO/NCR and submit the receipt to Sr.DMO I/c Medical Store through Chief Pharmacist I/c Medical Store within 10 days of default. Firm also have the option of requesting to deduct the penalty from their pending bill (if pending). Till the ‘Penalty’ is cleared, the firm will not be considered for future enquiries and their pending bills will not processed for payment. However, the Railway’s reserves the right to deduct the penalty from any pending bills of the firm. 15. If the material is not supplied within ‘Delivery Period’, ‘Medical Store’ CH/NCR will purchase the defined material (Substitute) from L-2 offer or LP (15% rebate at present) as per the necessity of the Central Hospital and the difference in cost will be deducted from the pending bill. If no bill is due, then the firm will be communicated to deposit the balance amount in the Railway revenue (Cash Office) by Cash or crossed Demand Draft drawn in f/o FA&CAO/NCR and submit the receipt to Sr.DMO I/c Medical Store /CH/NCR/ALD through Chief Pharmacist I/c Medical Store. Till the penalty is deposited, the firm will not be considered for future enquiries. Also the ‘Security Deposit’ will not be released. If the firm will not deposit the Penalty amount within 6 months of default then the ‘Security Deposit’ will have to be forfeited and no further orders will be given to that firm and the process for ‘Black Listing’ the firm can also be initiated. 16.If the material is supplied after ‘Delivery Period’ the LD @ 2% or Risk purchase cost per item as penalty (whichever is higher) will applicable o­n Purchase Orders. The penalty can be deducted from any pending bill. Material will not be accepted after 30 days of expiry of DP. 17.Penalty Clause will also be applicable in case of short supply if supplied quantity is <70% of the quantity defined in PO. 18.The same Brand as quoted by the firm in the ‘Rate Enquiry’ and specified in PO will be accepted. The Medicine should have more than half of valid shelf life at the time supply it is received in the ‘Medical Store’. 19. If due to non-availability of the Brand defined in ‘Rate contract’ in the market, request to supply alternate brand is made, it should be accompanied by fee of Rs.300/- submitted as Cash receipt or DD drawn in f/o FA&CAO/NCR per item. Alternate material will o­nly be accepted if approved by rate contract accepting authority. In future supplies also 1% of the cost of PO will be deducted if alternate material (Accepted by contract accepting authority) is supplied. There will be no change in the Net Rate if the MRP of alternative supplied material is higher. If the MRP is lower, then the Rebate Offered o­n MRP in the Rate Contract will be applicable. 20.There should be no tampering of the ‘Standard Packing’ and tampered packing will not be accepted by Medical Store. 21.If at least three offers are not received against the rate enquiry made to ‘Registered Firms’, material will be procured for the minimum quantity required even o­n single offer with approval of MD/CH, o­nly if offer is reasonable, and will be valid till the re-quotation is finalized to meet the emergency requirement and continuity of supply chain. However, the process for re-quotation of all items for which less than three offers have been received will be initiated o­n priority. 22.The procurement of common use items will be done from the registered wholesale supplier or Manufacturing Company after rate enquiry with approval of MD/CH. As the quantity will not be mentioned in the ‘Rate Enquiry’ and the supplier undertakes to supply as and when a supply order against the rate quoted by them in the ‘Rate Enquiry’. 23.Offers received against the rate enquiry may be technically evaluated by the user Specialist Doctor or by the Doctor nominated by Medical Director before finalization of Rate Contract. 24.The rates o­nce defined will be valid for at least 6 months from the date of acceptance of the offer by Medical Director, CH/NCR/ALD. If agreed by Firm the extension of validity of offer can be accepted if the rates are justified and it is financially advantageous to the Railways as per extent rules. c.Technical Committee recommendations and decision of MD/CH will be final. 26.Firms should have a valid License for dealing in Medical and Surgical items as a ‘Whole Sale Supplier’. 27.MD/CH with finance concurrence is the competent authority to modify the existing Terms and Conditions according to local needs for smooth functioning of Hospital. 28.As and when the facilities are available with the store, E-procurement will be introduced by ‘Medical Store’ CH/NCR/ALD for Bulk Local Purchase and also for Local Purchases. The firm applying for Registration for supplying the ‘Medicine and Surgical items’ should be the Manufacturer or an ‘Authorized Distributor/ Stockist / Institutional supplier of o­ne or more reputed ‘Drug Manufacturing Companies’ registered at CMD Office, NCR Headquarter Office, Subedarganj, Allahabad for supply of medicines in North Central Railways. Marketing companies who are manufacturing the drug should essentially have their Office and Distributor in UP and preferably have their local office at Allahabad along with distributor for early communication and supply of orders. The rate enquiry for supplying the ‘Medicine and Surgical items’ will be sent to companies manufacturing the item or their ‘Authorized Distributor/ Stockist / Institutional suppliers registered at ‘Medical Store’ Central Hospital, NCR, Allahabad. The List of Manufacturing Companies for which the supplier is ‘Authorized Distributor/ Stockist / Institutional supplier should be furnished at the time of registration. Registered Firm should have capability to meet supply orders of Central Hospital, North Central Railway Allahabad. The annual turnover of the Firm should be more than ₹ 50 lakhs per annum. Against the quotation notice for the items the rates offered by the firm have to be quoted per unit along with % of Discount offered o­n MRP. If any Taxes are to be charged it should be clearly defined at the time of submission of quotation for ‘Rate Contract’ of that item. The firm will have to define the ‘Brand Name’, Manufacturing Company, Marketing Company, Therapeutic salt Content per unit, MRP of the Brand quoted. The L-1 will be decided o­n the rate offered inclusive of Taxes. o­nce the rate contract is accepted, no upward revision in rates will be permitted for six months except for revision in Tax Rates. However, if there is reduction in MRP by the Manufacturing firm at the time of supply, the payment will be made o­n the net calculated as rebate given o­n MRP in quotations. ‘Fall Clause’ will be applicable o­n the Rate Contract and rates will be amended accordingly. If there is any discrepancy in the rates calculated by % of rebate offered o­n MRP and the Net Rate quoted by the firm, the lower of the two will be accepted. ‘Medical Store’ Central Hospital, NCR, Allahabad may call for fresh quotations/ Rate enquiries even before expiry of six months period if they so desire considering the changes in the market positions for those items with approval of MD/CH..
‘Order for Bulk Supply’ will be intimated through E-mail and ‘Hard Copy’ as well. Receipt of order & Acceptance should be confirmed by e-mail o­nly. The supplier should collect the ‘Hard Copy’ of ‘Bulk Purchase Order’ from the ‘Medical Store’ Central Hospital, NCR, Allahabad. The ordered material should be delivered within the defined DP in the ‘Bulk Purchase Order’ (within 10 days of dispatch of order by E-mail) at ‘Medical Store’ Central Hospital, NCR, Allahabad. If the material is not received within the DP period the Penalties will be charged as defined in Bulk Purchase Policy Para 15, 16, 17 and 18. The responsibility to pay the ‘Penalty’ and get it cleared from the records by submitting the receipts to ‘Sr.DMO I/c Medical Store’ through Chief Pharmacist I/c Medical Store, Central Hospital, North Central Railway, Allahabad, will be of the defaulting firm. On failure to receive the supply, the Medical store will procure the material from alternative source and the cost Difference will be recovered from the defaulting supplier in addition to the penalty imposed for not supplying the order. If any complaint regarding the substandard Quality of Material supplied / Material not as per specifications is received by store, it will forwarded to the supplier who will ensure that the issue is addressed o­n priority within 5 working days of receiving the communication by him o­n E-mail and is resolved by the supplier/ Manufacturing company representative. The firm will have to replace the whole supply of the reported sub-standard material at their cost within 7 days. ‘Cost of Analysis’ will be deducted from the pending bill of the supplier. The Bill of the material supplied will not be cleared till damage to be recovered from the supplier due to supply of sub-standard material is calculated. The other pending bills of the Firm will not be processed till the loss is calculated and finalized by competent authority. It will be recovered from the pending bills. The ‘Performance Guarantee’ will be seized. The name of the firm from the list of Registered Suppliers for supply of will be deleted. Items for which this firm is L-1 will be purchased from the alternative sources (L-2 or LP) till the fresh quotation is finalized and the difference will be recovered from the pending bills of the defaulter firm. Any legal action required will be taken against the Firm which supplied the Sub-Standard material. The Process for Black-listing both the Supplier and Manufacturing Firm whose material is sub-standard o­n analysis will be initiated. Matters finally determined by the Railway – All disputes and differences of any kind whatsoever arising out of or in connection with the contract, whether during the progress of the work or after its completion and whether before or after the determination of the contract shall be referred by the contractor to the GM and GM shall within 120 days after receipt of the Contractor’s representation make and notify decisions o­n all the matters referred to by the contractor in writing provided that matters for which provision has been made in clauses 8, 18, 22(5), 39, 43(2), 45(a), 55, 55-A(5), 57, 57(A), 61(1), 61(2) and 62(1) to (xiii)(B) of General Condition of Contract or in any clause of the Special Conditions of the contract Shall be deemed as ‘excepted matters’ (matters not arbitrable) and decision of the Railway authority, thereon shall be final and binding o­n the contractor provided further that ‘excepted matters’ shall stand specifically excluded from the purview of the arbitration clause. 64 (1) (i) Demand for Arbitration – In the event of any dispute or difference between the parties hereto as to the construction or operation of this contract or the respective rights and liabilities of the parties o­n any matter in question, dispute or difference o­n any account or as to the withholding by the Railway of any certificate to which the contractor may claim to be entitled to, or if the Railway fails to make a decision within 120 days, then and in any such case, but except in any of the ‘excepted matters’ referred to in Clause 63 of these conditions, the Contractor, after 120 days but within 180 days of his presenting his final claim o­n disputed matters, shall demand in writing that the dispute or difference be referred to arbitration. 64 (1) (ii) The demand for arbitration shall specify the matters which are in question or subject of the dispute or difference as also the amount of claim item wise. o­nly such dispute or difference, in respect of which the demand has been made, together with counter claims or set off, given by the Railway, shall be referred to arbitration and other matters shall not be included in the reference. 64 (1) (ii)(a) The arbitration proceeding shall be assumed to have commenced from the day, a written and valid demand for arbitration is received by the Railway. (b) The claimant shall submit his claim stating the facts supporting the claim along with all relevant documents and the relief or remedy sought against each claim within a period of 30 days from the date of appointment of the Arbitral Tribunal. (c) The Railway shall submit its defence statement and counter claim (s), if any, within a period of 60 days of receipt of copy of claim from Tribunal thereafter unless otherwise extension has been granted by Tribunal. (d) Place of arbitration- The place of arbitration would be within the geographical limits of the Division of the Railway where the cause of action arose or the Headquarters of the concerned Railway or any other place with the written consent of both the parties. 64 (1) (iii) No new claim shall be added during proceedings by either party. However, a party may amend or supplement the original, claim or defence thereof during the course of arbitration proceedings subject to acceptance by Tribunal having due regard to the delay in making it. 64 (1) (iv) If the contractor(s) does/do not prefer his/their specific and final claim in writing, within a period of 90 days of receiving the intimation from the Railways that the final bill is ready for payment, he/they will be deemed to have waived his/their claim(s) and the Railway shall be discharged and released of all liabilities under the contract in respect of these claims. 64 (2) Obligation during pendency of arbitration- Work under the contract shall, unless otherwise directed by the Competent Railway Authority, continue during the arbitration proceeding, and no payment due or payable by the Railway shall be withheld o­n account of such proceedings, provided, however, it shall be open for arbitral Tribunal to consider and decide whether or not such work should continue during arbitration proceedings. 64 (3) (a) (i) In cases where the total value of all claims in question added together does not exceed Rs. 10,00,000/- (Rupees Ten Lakhs o­nly, the Arbitral Tribunal shall consist of a Sole Arbitrator who shall be a gazette officer of Railway not below JA grade nominated by the General Manager. The Sole Arbitrator shall be appointed within 60 days from the day when a written and valid demand for arbitration is received by GM. 64 (3) (a) (ii) In cases not covered by the clause 64(3)(a)(i), the Arbitral Tribunal shall consist of a panel of three Gazetted Rly Officers not below JA grade or 2 Railway Gazetted Officers not below JA Grade and a retired Railway Officer, retired not below the rank of SAG Officer, as the arbitrators. For this purpose, the Railway will send a panel of more than 3 names of Gazetted Rly. Officers of o­ne or more departments of the Rly, which may also include the name(s) of retired Railway Officer(s) empanelled to work as Railway Arbitrators to contractor within 60 days from the day when a written and valid demand for arbitration is received by the GM. Contractor will be asked to suggest to General Manager at least 2 names out of the panel for appointment as Contractor’s nominee within 30 days from the date of dispatch of the request by Railway. The General Manager shall appoint at least o­ne out of them as the contractor’s nominee and will, also simultaneously appoint the balance number of arbitrators either from the panel or from outside the panel, duly indicating the ‘presiding arbitrator’ from amongst the 3 arbitrators so appointed. GM shall complete this exercise of appointing the Arbitral Tribunal within 30 days from the receipt of the names of contractor’s nominees. While nominating the arbitrators it will be necessary to ensure that o­ne of them is from the Accounts department. An officer of the Selection Grade of the Accounts Department shall be considered of equal status to the officers in SA grade of other departments of the Railway for the purpose of the appointment of arbitrators. 64 (3) (a) (iii) If o­ne or more of the arbitrators appointed as above refuses to act as arbitrator, withdraws from his office as arbitrator, or vacates his/their office/offices or is/are unable or unwilling to perform his functions as arbitrator for any reason whatsoever or dies or in the opinion of the General Manager fails to act without undue delay, the General Manager shall appoint new arbitrator/arbitrators to act in his/their place in the same manner in which the earlier arbitrator/arbitrators had been appointed. Such re-constituted Tribunal may, at its discretion, proceed with the reference from the stage at which it was left by the previous arbitrator(s). 64 (3) (a) (iv) The Arbitral Tribunal shall have power to call for such evidence by way of affidavits or otherwise, as the Arbitral Tribunal shall think proper, and it shall be the duty of the parties hereto to do or cause to be done all such things as may be necessary to enable the Arbitral Tribunal to make the award without any delay. The Arbitral Tribunal should record day-to-day proceedings. The proceedings shall normally be conducted o­n the basis of documents and written statement. 64 (3) (a) (v) While appointing arbitrator(s) under Sub Clause (i) (ii) and (iii) above, due care shall be taken that he/they is/are not the o­ne/those who had an opportunity to deal with the matters to which the contract relates or who in the course of his/their duties as Railway servant(s) expressed views o­n all or any of the matters under dispute or differences. The proceedings of the Arbitral Tribunal or the award made by such Tribunal will, however, not be invalid merely for the reason that o­ne or more arbitrator, had in the course of his Service, opportunity to deal with the matters to which the contract relates or who in the course of his/their duties expressed views o­n all or any of the matters under dispute. 64 (3) (b) (i) The arbitral award shall state items wise, the sum and reasons upon which it is based. The analysis and reasons shall be detailed enough so that the award could be inferred there form. 64 (30) (b) (ii) A party may apply for corrections of any computational errors, any typographical or clerical errors or any other error of similar nature occurring in the award of tribunal within 60 days of the receipt of the award. 64.4 – In case of the Tribunal, comprising of three members, any ruling or award shall be made by a majority of Members of Tribunal. In the absence of such a majority, the views of the Presiding Arbitrator shall prevail. 64.5 – Where the arbitral award is for the payment of money, no interest shall be payable o­n whole or any part of the money for any period till the date o­n which the a3ward is made. 64.6 – The cost of arbitration shall be borne by the respective parties. The cost shall interalia include fee of the arbitrator(s) as per the rates fixed by the Railway Board from time to time and the fee shall be borne equally by both the parties. Further, the fee payable to the arbitrator(s) would be governed by the instructions issued o­n the subject by Railway Board from time to time irrespective of the fact whether the arbitrator(s) is/are appointed by the Railway Administration or by the Court of law unless specifically directed by Hon’ble Court otherwise o­n the matter. 64.7 – Subject to the provisions of the aforesaid Arbitration and conciliation Act 1996 and the rules there under and any statutory modification thereof shall apply to the arbitration proceedings under this clause.